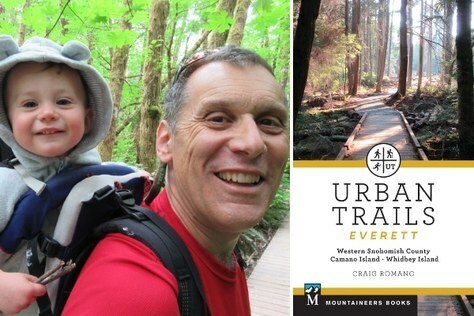 Get out and stay local, with Craig Romano's new guide to "Urban Trails: Everett," including Western Snohomish County, Whidbey Island, and Camano Island. 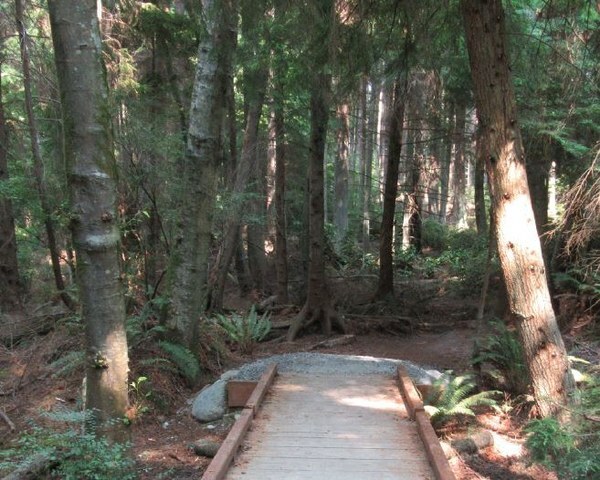 The following is excerpted from Urban Trails: Everett by Craig Romano, and features three great hikes on Whidbey Island: Ebey's Landing National Historic Reserve, Trillium Community Forest, and Dugualla State Park. Edited for space and clarity. Washington’s largest island is named after Joseph Whidbey, a member of the Royal Navy who served on Captain George Vancouver’s expedition to the region in the 1790s. The fourth-largest island in the continental United States (after New York’s Long Island, Michigan’s Isle Royale, and Texas’s Padre Island), Whidbey contains some of the finest beaches within Puget Sound. 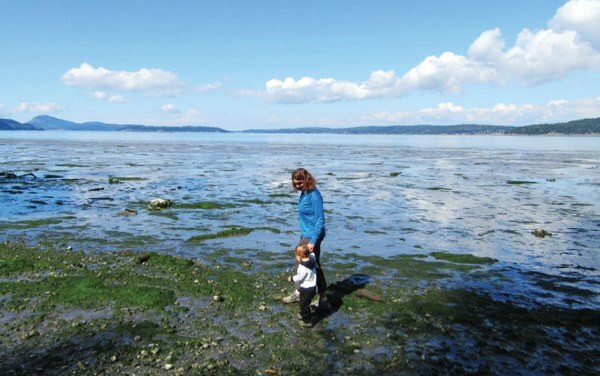 And thanks to an array of county, state, and national park lands, as well as the active Whidbey Camano Land Trust, the island harbors large tracts of undeveloped land and a large trail network. Whidbey is home to 60,000 residents, nearly half of whom reside in and around Oak Harbor and its Naval Air Station. Much of the rest of the island is rural. Whidbey Island is about 55 miles long and ranges in width from 1.5 miles to 10 miles—you are never far from the Salish Sea on this landmass. The northern half of the island lies within the Olympic rain shadow and sees some of the lowest annual rainfall amounts within the Puget Basin. However, due to its proximity to the Strait of Juan de Fuca, Whidbey receives its fair share of windstorms. Overall, however, the island’s weather is quite agreeable year-round for hiking, walking, and running. The southern end of the island is connected to the mainland by ferry service to Mukilteo—a short drive from Everett and much of southern Snohomish County. Ferries also connect the island’s midsection at Coupeville to Port Townsend on the Olympic Peninsula. And the northern end of the island is connected to the mainland by a series of bridges via Fidalgo Island, allowing for easy access from North Sound communities. Driving from Everett: Drive to the state ferry terminal in Mukilteo and take the ferry to Clinton on Whidbey Island. Then continue north on State Route 525 for 22 miles and proceed straight on SR 20. Drive for 6.3 miles on SR 20 and turn left onto S Sherman Road (the turnoff is 0.8 mile north of the Coupeville traffic light). Then proceed for 0.3 mile, turning right onto Cook Road. After another 0.3 mile reach the Prairie Overlook and trailhead. Driving from Oak Harbor: Follow SR 20 south 8.7 miles and turn right onto S Sherman Road. Then proceed for 0.3 mile, turning right onto Cook Road. After another 0.3 mile reach the Prairie Overlook and trailhead. Transit: Island Transit Route 6 stops near the Kettles Spur Trail. Stroll across emerald fields, climb coastal bluffs towering above crashing surf, and wander along a driftwood log–strewn beach, gazing across busy coastal waters to a backdrop of snowcapped Olympic Mountains. And there’s more! 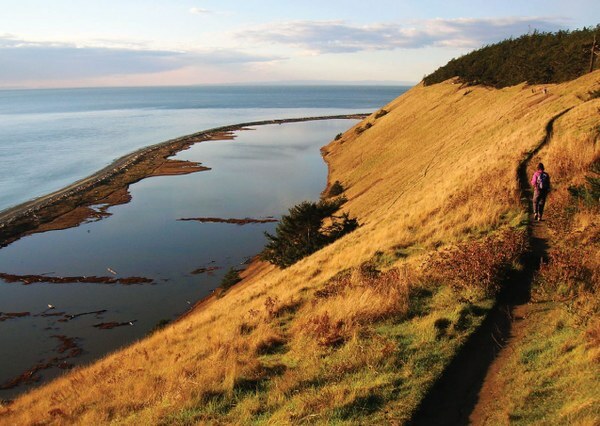 With prairie flowers, bald eagles, shorebirds, and historic relics, Ebey’s Landing is one of Washington’s most naturally diverse and historically significant places. Driving from Everett: Drive to the state ferry terminal in Mukilteo and take the ferry to Clinton on Whidbey Island. Then continue north on State Route 525 for 10.5 miles, turning left onto Bush Point Road. After 2.2 miles the road becomes Smugglers Cove Road. Continue for another 1.7 miles to the large parking area and trailhead on your right. Driving from Oak Harbor: Follow SR 20 south 14.7 miles and continue straight onto SR 525. After 4.7 miles turn right onto Smugglers Cove Road and continue 5.3 miles to the large parking area and trailhead on your left. Thank the Great Recession for this 700-plus-acre tract of protected forest—one of the largest undeveloped parcels on the island. This area was slated for high-density housing, but the developer went bankrupt, and the Whidbey Camano Land Trust led a fundraising drive in order to buy it. Fifteen hundred folks pitched in to create this community forest, now containing 7 miles of trails (many old skid roads) perfect for easy strolls and long runs. Driving from Oak Harbor: Follow State Route 20 east for 4 miles and turn right onto E Sleeper Road. Continue for 2.5 miles to road’s end and trailhead. Driving from Burlington: Follow SR 20 west for 24 miles and turn left onto E Sleeper Road. Continue for 2.5 miles to road’s end and trailhead. A former Department of Natural Resources property once slated to be logged, Dugualla is now a 586-acre satellite of Deception Pass State Park. Hike or run more than 5 miles of trails here, following old skid roads and newer single-tracks through mature stands of timber, including a couple of old-growth giants. There is also a mile of coastline to walk when the tide is low. And while this property lacks amenities other than trail signs, it also lacks crowds. Read more in Craig Romano's Urban Trails: Everett, available now where books are sold.